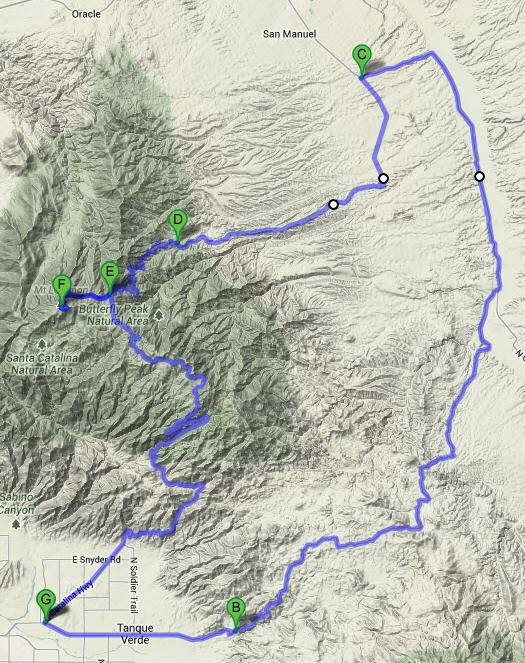 This is a 105 mile loop that climbs Mt Lemmon from the north-east, riding first over Redington Road. It has about 52 miles of dirt roads and 53 miles of paved roads. Markers B and E on the map show where the ride switches between pavement and dirt. Marker B, a short way up the Redington Road hill, 8 miles after the start, is the start of the dirt. Marker C is where you turn left up the Black Hills Mine Road dirt road. Marker D is where Black Hills Mine Road joins the Control Road. Marker E is where the Control Road joins the paved road just above Summerhaven. Marker F is the parking lot at the top of Mount Lemmon. Markers B to F are represented by the vertical red lines in the elevation profile. As you can see, you climb quickly up the dirt part of Redington Road, followed by a long descent. Then you do a long, long climb to the top of Mount Lemmon, and descend the paved road. Park at the NE corner of Tanque Verde and Catalina Highway (the LeBuzz/Safeway parking lot). Ride east on Tanque Verde until it becomes Redington Road. Follow this until it eventually climbs steeply up a few switchbacks then turns into dirt, 8 miles from the start. Redington Road is easy to follow. 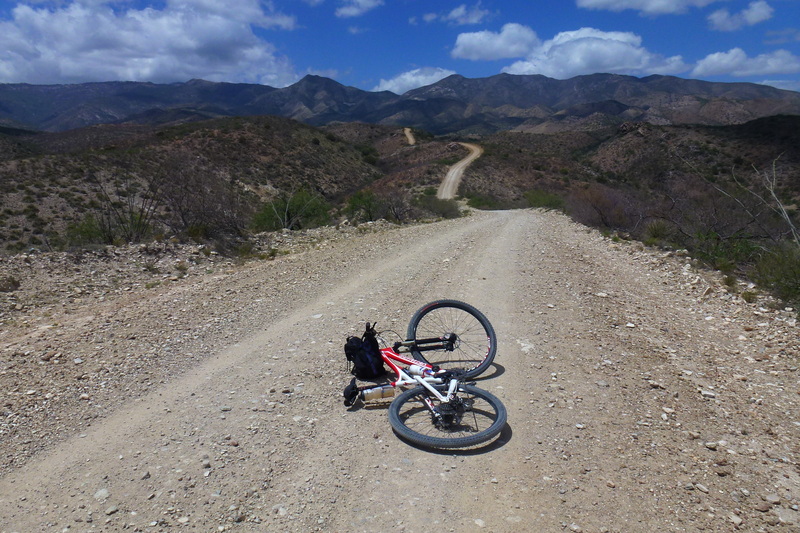 You follow the obvious main dirt road for 24 miles as it meanders up and down and around. The only place you might be concerned is between mile markers 14 and 15 where there’s a fork in the road. The road takes the left, bigger, fork. The weird thing is that you spend a surprising amount of time heading east, away from Mount Lemmon. 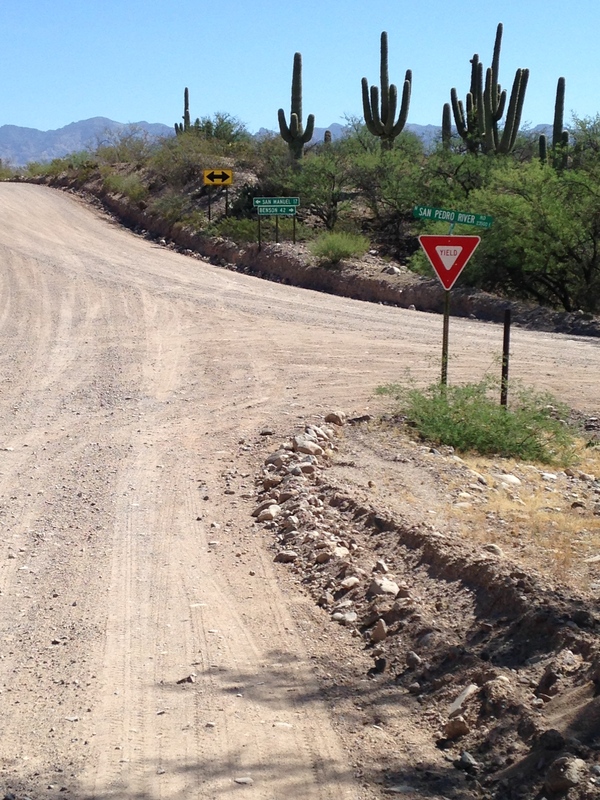 Shortly after mile marker 27 you’ll reach a major intersection where the San Pedro River Road comes in from the right. Turn left towards San Manuel. From here, there are about 4.5 miles of dirt road before the road suddenly and inexplicably becomes paved at the Pinal / Pima county boundary. Follow the paved road as it rolls northward. Eventually the road turns sharp left towards Mount Lemmon. Somewhat after MM 18 the road crosses a cattle guard and sweeps right. At this point turn left and cross another cattle guard onto the big, unsigned Black Hills Mine Road (BHMR), also known as FR 4450. Follow BHMR back the way you came (!) for 5 miles until it descends into a small canyon. Climb back out the other side then follow the road as it turns right and finally, thankfully, heads towards Mt Lemmon. In another 9.5 miles, BHMR joins the Control Road (FR 38). Turn left and follow the Control Road as it climbs more steeply towards Summerhaven. After 9 miles of harder riding with more turns and switchbacks and glorious views you will finally reach the Mt Lemmon paved road just above Summerhaven. Turn right and descend 0.2 miles to Ski Run Road, then turn right and climb another 3.1 miles to the parking lot at the top of Mt Lemmon. Then turn round and ride (mainly) down the paved road back to the car, 32.2 miles from the top. The ride took me 12 hours 30 minutes, which is probably a decent but not fast time. Rode it on May 7, 2014. Thank you for this post. We used it to plan a test for a planned Australian outback tour. We took three days, two nights out, but did not go to the summit of Mt. Lemmon. We carried 14 and 17 litres of water, three days of food, tent, sleeping pads and bag, tools etc. It was a grunt, but it appears we should be able to carry enough water and food for Australia; flat mostly, but with bull dust, also a grunt. It will be a return tour from 1999-2000, 16 yeas ago, when we bicycle toured 12,000 miles and made many Aussie friends. That trip is documented on our New Bohemians site, Around Australia by Tandem Bicycle.